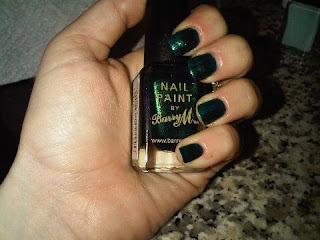 Anyway, This is Barry M in Racing green. It is a shimmery Forest Green with a Teal undertone, very peacock! LOVE! I have looked for a dupe of this and there is not one to be found! Love this polish! Probably my favourite Barry M! I have this too! It's one of my favourites!! Wow never really noticed this shade before! So pretty! I love that polish but it stains SO BAD! I saw this you wearing this on a recent youtube video you did. Gorgeous!! I bought this yesterday on a 3 for 2. It is gorgeous! !